What do you get if you take a generous helping each of Shakespeare’s Merchant of Venice and Othello, a dash of King Lear, and a big splash of Edgar Allan Poe’s “A Cask of Amontillado” and put it in a blender with Monty Python? I’m not sure, but I think it would look a lot like Christopher Moore’s novel The Serpent of Venice. 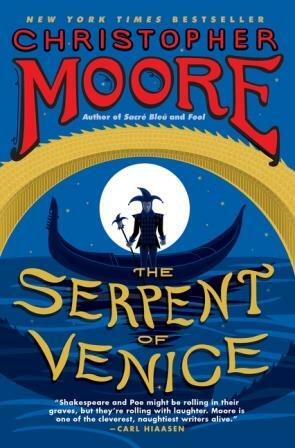 The Serpent of Venice is the continuing story of King Lear’s fool, Pocket, first introduced in Moore’s book Fool. Lured to Venice by Montressor Brabantio, Iago, and Antonio, Pocket is chained and walled up inside Brabantio’s dungeon. A mysterious creature rescues Pocket, who seeks his revenge against the trio with the help of Othello, Shylock, and Jessica and the mysterious creature, the Serpent of Venice herself. I chose Merchant and Othello, obviously, because they are set in Venice. Early on, as I dissected them to see what parts I could stitch back together to make the abomination that became The Serpent of Venice, I started noting that the characters in each of the plays perform similar functions, and although I didn’t research it, I suspect the parts were written for the same actors. I admit the Shakespearean scholar in me wants to take that project on. It would be interesting to uncover—I’m sure someone’s done it already. For the record, The Merchant of Venice is dated from around 1596-1597, while the earliest mention of Othello is 1604. Will Kempe, Shakespeare’s famous clown, departed the Lord Chamberlain’s Men acting company in 1599 and thus his successor Robert Armin likely played the Fool or Clown in Othello and also in King Lear, though Kempe probably did play Lancelot Gobbo in Merchant. Richard Burbage certainly played Othello, and this epitaph suggests he played Shylock. More research is beyond the scope of the resources I have at hand. Nevertheless, the entire Afterword reveals the depth of research Moore did in order to bring 13th century Venice alive, as well as combine the three major works of literature that comprise this tale. Further, it’s intriguing that the two Shakespearean plays, aside from being set in Venice, are also the two major plays that include marginalized characters such as Shylock and Othello. CHORUS: And thus was friendship formed. Two outsiders, outside a palace in the night, found fellowship in their troubles, and there one’s problems became the other’s purpose. “Who is that?” asked the fool. The reviews on this one are a little mixed, and I gather it’s mainly folks who don’t appreciate the humor who give the book low ratings. I laughed often as I read. Moore has a gift for humor, or at least I think he’s funny, though I should think folks who find it sacrilegious to tamper with Shakespeare and don’t even like it when his plays have modern settings should probably not read this book. I think having read Shakespeare will help the reader appreciate the humor and allusions in this book. This book is probably not right for everyone, but I loved it. 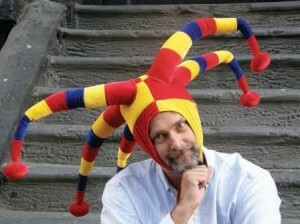 For the record, I think Shakespeare himself would have loved it, too. Edgar Allan Poe? Famously a strange guy. I’m not sure what he would have thought. Of course, I also think that Monty Python and the Holy Grail is the best King Arthur movie ever made (and I’m not even kidding about that—it’s closest to the Welsh stories that are the origin for Arthurian legend). “As plagues go, frogs are not so bad?” I was raised in a nunnery. I know Testaments Old and New. If you think that’s funny (I laughed out loud), then you’re probably game for the rest of the book. If you were offended, this is not the book for you. For my part, I’m running right out to read Moore’s other books. Moore’s humor definitely isn’t for everyone but he IS hilarious! I hope you’ll love his other books just as much as you did this one. Books are the carriers of civilization. Without books, history is silent, literature dumb, science crippled, thought and speculation at a standstill. Bad Behavior has blocked 548 access attempts in the last 7 days.